Portland’s Dark/Light pronounces their name phonetically, including the punctuation. 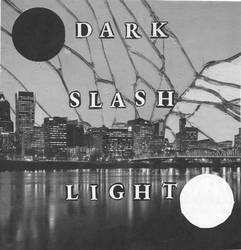 They’re doubling down on that element by naming this 7”, released this past June, Dark Slash Light. SPB had the pleasure of hosting their earlier LP, Kill Some Time. As for this 4-song, 9-minute release, it keeps going in that tradition of gritty and to-the-point punk that pulls from ‘80s punk roots but has a restrained, pull-it-back and look inward vibe. It’s short and fast with fuzzy DIY-minded production, muddy bass, and that restrained energy. Candy’s vocals often establish the direction of the songs as the percussion delivers an anxious core. To me, “Rotting” is the best example of what they do. It’s only a minute and nine seconds, but it builds at the start, hits with a potent energy, and offers moving progressions that ebb, flow, and pummel quickly. Backing and subtle call-and-response vocals flesh it out even more and fuel that sense of urgency that’s behind the whole short-playing record. While I’m summarizing the band’s sound a bit, this 7-inch shows range, mixing it up nicely within that fundamental style. “We Conjure Ghosts” has a darker vibe to it that’s less melodic and more atmospheric. In the next song, “Night Driving,” it continues to let the atmospheric tones leads the song while simultaneously keeping the same energy going. This is music that wears its emotions on its sleeve. Instead of vitriolic rage, it’s a more conflicted sense of frustration. Posted Feb. 4, 2019, 7:31 p.m.
Posted Sept. 5, 2017, 10:31 p.m.